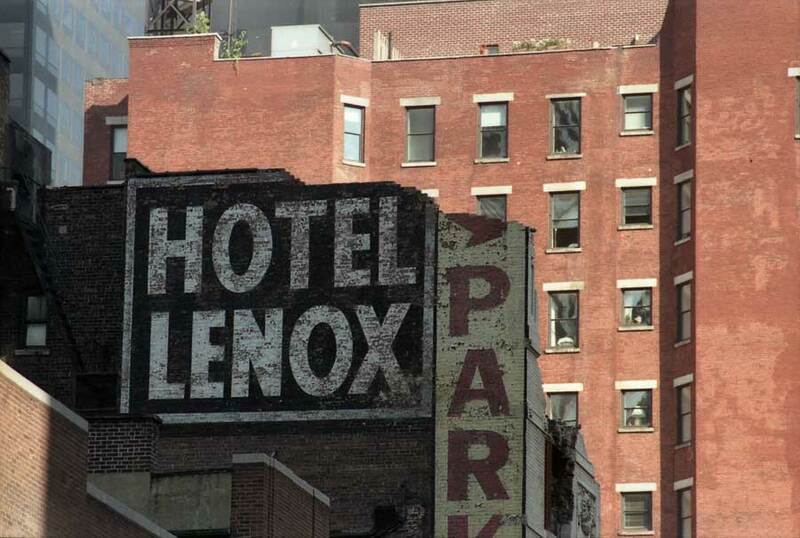 The Hotel Lenox was far more prominent in its ending than in its beginning. The building itself possibly dated to the 1890s. It was a modest 7 stories high, and was functioning as a hotel by 1906, went through a succession of names (Dunlop, Royal, Rex, and Dresden) until 1915 when the name Lenox was adopted. It then remained the Hotel Lenox until its partial demolition during the night of 7 January 1985. As reported in the New York Times, 10 Jan. 1985, "NIGHTTIME DEMOLITION LEAVES A 44TH ST. MYSTERY ... The buildings, at 143, 145, 147 and 149 West 44th Street were partly torn down well after 6 P.M. Monday, according to city officials, by workers who used unorthodox methods at a distinctly unorthodox time of day. The demolition forced the city to close the street, between the Avenue of the Americas and Broadway, causing traffic jams in Times Square, and left the block covered in dirt and rife with confusion. The buildings' owner of record, according to Charles M. Smith Jr., the city's Buildings Commissioner, is Margo Properties, a company controlled by Sol Goldman, one of the largest real-estate operators in the metropolitan area, where he is estimated to hold nearly 500 properties. The demolition contractor, Mr. Smith said, was Mitran Associates Inc., of 600 Smith Street in Brooklyn. Mr. Goldman could not be reached at his office yesterday. Two of the damaged buildings were single-room-occupancy hotels, and yesterday the Koch administration formally presented the City Council with a proposed moratorium on the conversion or demolition of S.R.O. hotels. The measure would be retroactive to yesterday. ... Among the buildings was the Lenox Hotel, at No. 149, a seven-story S.R.O. with 59 rooms that was occupied until about a month ago, according to merchants on the street. No. 143 was a five-story, 18-unit S.R.O. hotel, and the other two structures were long-vacant walk-up residential buildings, officials said. The two hotels were the less heavily damaged of the four buildings." This was followed (New York Times, 8 May 1985) with further developments: "A major Manhattan real-estate company and one of its vice presidents pleaded guilty yesterday to charges resulting from the illegal nighttime demolition of four Times Square buildings in January. The company, the West 45th Street Macklowe Corporation, and its vice president in charge of construction, John Tassi, were allowed to plead guilty to misdemeanor charges of reckless endangerment without receiving any jail sentence. In an agreement with the city, Harry Macklowe, the president of the real-estate company and the buyer of the buildings, agreed to give the city $2 million to help build and maintain single-room-occupancy dwellings in the city. The four buildings, all on 44th Street between Seventh Avenue and the Avenue of the Americas, were torn down in darkness two days before a proposed moratorium on the destruction of all single-room-occupancy hotels was to take effect. The purpose of the 'rapid demolition,' said Robert M. Morgenthau, the Manhattan District Attorney, was 'to avoid the moratorium on the destruction of single-room-occupancy buildings.' Mr. Morgenthau also announced the indictments of a real-estate owner who was selling the buildings - Sol Goldman - and the owner of a demolition company, Edward Garofalo. Mr. Goldman was charged with perjury. Mr. Garofalo and his company, Mitron Associates of Brooklyn, were charged with reckless endangerment and violating the administrative code. They pleaded not guilty at their arraignment in State Supreme Court before Justice Robert Haft. Justice Haft, accepting Mr. Tassi's guilty plea and granting him a conditional discharge, said that Mr. Macklowe's $2 million agreement with the city had 'played a substantial role in my sentence.' With the completion of a four-month grand jury inquiry into the demolition of the buildings, which were torn down without proper permits and without gas, electricity or water being turned off, Mr. Morgenthau said that the criminal laws, as constructed, were 'too weak' to deal with this type of case. Mr. Morgenthau said that had the defendants turned off the gas, electricity and water and constructed the necessary scaffolding to protect pedestrians from falling debris, they would have only been subjected to a violation of the administrative code for failing to obtain a demolition permit. The sanctions for such an offense, he said are a 15-day jail term and a $1,000 fine. 'It should be a felony to tear down a building,' he added. The $2 million agreement also settled a claim by the city against Mr. Macklowe and his organization that arose out of his role in the illegal demolition of the buildings, including the Lenox Hotel, a seven-story S.R.O. hotel at 149 West 44th Street. The city had filed a $10 million civil suit against Mr. Macklowe, Mr. Goldman and Mr. Garofalo. The suit against Mr. Goldman and Mr. Garofalo is pending." Several years later one of the figures involved in the demolition was killed in what appeared to be a mob-related slaying, reported in the New York Times, 10 August 1990, "A construction company owner who illegally demolished four buildings in Times Square in the middle of the night in 1985 was shot to death Wednesday in front of his house in Brooklyn in what the police described as a mob-style slaying. The victim, Eddie Garofalo, 49 years old, was hit by a hail of bullets - behind the ear, in his back and in his torso. ... Mr. Garofalo, who was known as Cousin Eddie, and one of his companies, Mitron Associates, were indicted in the demolition of four buildings at West 44th Street in 1985. He pleaded guilty and was convicted of reckless endangerment and demolishing the buildings without a permit, said Colleen Roche, a spokeswoman for the Manhattan District Attorney's office. City officials had accused Harry Macklowe, the developer and hotel owner, of ordering the demolition one day before a moratorium on razing single-room-occupancy hotels was to take effect. Two of the 44th Street buildings were S.R.O.'s. According to testimony at the trial, Mr. Macklowe had agreed to pay Mr. Garofalo $500,000 to begin demolition of the Lenox Hotel at 149-51 West 44th Street and three buildings around it on Jan. 7, and to finish that job and the demolition of three other buildings on West 45th Street in 12 weeks. Mr. Garofalo was given a conditional discharge, fined $2,000 and his company was fined $51,000, Ms. Roche said. Mr. Macklowe paid $2 million to settle a civil suit by the city. " The Hotel Lenox can be seen in a photograph on the New York Public Library's Digital Collections. This is an undated image created by the Wurts Bros., probably in the 1930s. The Lenox is a modest 7-stories several doors west of the more impressive Hotel Langwell. The 1920 U. S. Census recorded 40 residents at 149-151 W. 44th St. These included Frederick E. Anderson, manager, and his wife Frieda, who were immigrants from Sweden. Frederick Edwin Anderson (1873-1927) registered for the World War I draft in 1918 when he was hotel manager at the Lenox Hotel 149-151 W. 44th St. In 1930 the census captured only 16 residents, including Richard Riley, age 40, now manager. 10 July 1930, the New York Times reported the sale of the Lenox Hotel, "With the recent purchase of the Hotel Lenox at 149-151 West Forty-fourth Street the Famous Players-Lasky interests have increased their holdings on the easterly Broadway block front between Forty-fourth and Forty-fifth Streets to a plot of approximately 50,000 square feet. . . . Title to the Lenox Hotel, a plot of 33.4 by 100.4 feet, will be taken in the name of the Seneca Holding Corporation, of which Adolph Zukor is president, and which is a subsidiary of the Famous Players-Lasky concern. It was purchased from Mrs. Frances M. Barnes, being the first sale of the property since 1893. The buying corporation gave a mortgage for $150,000, due July 1, 1933, at 5 1/2 per cent, to Mrs. Barnes, subject to a first mortgage of $80,000." Six years later, the Immigrant Industrial Savings Bank foreclosed against the Seneca Holding Co., and then sold the property to the Lenox Operating Co. The Times notice (22 Feb. 1936) regarding this sale did not specify who constituted the Lenox Operating Co.
From 1906 to 1909 the hotel at 149 W. 44th St. was known as the Hotel Dunlop. Then the name changed to the Hotel Royal. The Hotel Royal became the Hotel Rex in 1912, and a year later the Hotel Dresden. The Hotel Dresden became the Hotel Lenox in 1915. From 1915 to 1918 Frances M. Barnes (1858-1936) was listed as proprietor of the Hotel Dresden, then Hotel Lenox, at 149 W. 44th St. Her passport application in 1920 gave the Hotel Lenox as her residence. In 1975 a story in the Times reported the Lenox Hotel "vacated." Ten years later came demolition. My photo in 1986 caught it in its partially demolished state.